Summer goes out with a bang! Summer is nearly over. But the fun isn't done yet! Summer goes out with a BANG!!! Fall brings fun and fundraisers! Oktoberfest 2018 is the last full day of summer and what a great way to celebrate! Friday, Sept 21 at Canterbury Village! Come celebrate and help local and state Republicans at the same time! GO TO our website to order tickets now. Tickets also available at the door while they last. Fall is in the air...and on the calendar. Here is an event that should surely be on your calendar too! There are candidates that still need your help. Email or call the campaigns to see what you can do to help get out the vote! If you can't walk doors or make calls, then DONATE! This last big push to win is very expensive. Tuesday, Nov 6. VOTE!!! Then watch the results with a party at Clubhouse 81 on Lapeer Rd. 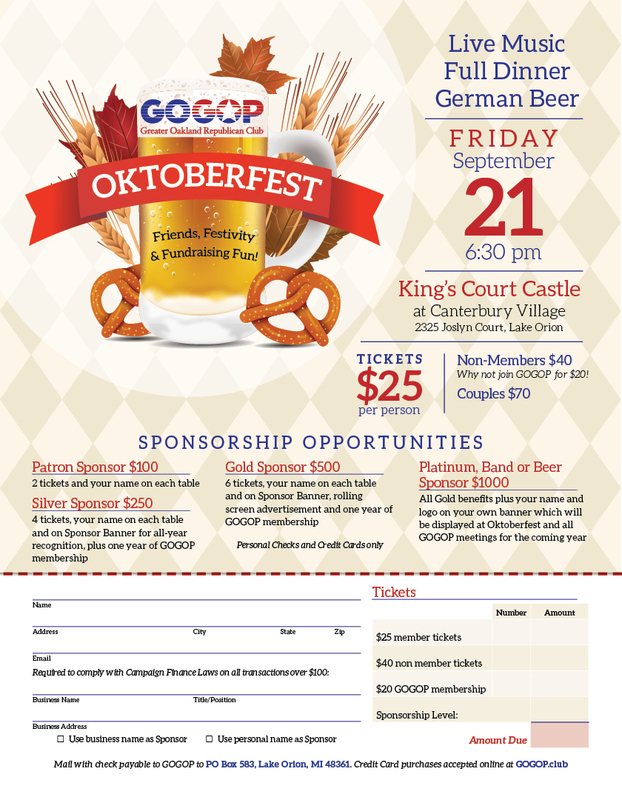 Hosted by Mike Gingell, Mike Spisz, Mike McCready, John Reilly, and of course, GOGOP! See you there after the polls close!